Gryphon Investors Announces Majority Investment in LEARN Behavioral - Berkery, Noyes & Co., LLC. 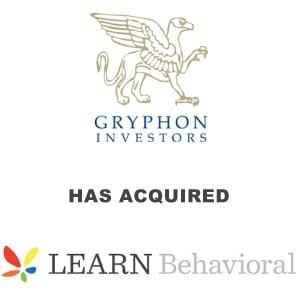 SAN FRANCISCO, March 19, 2019 /PRNewswire/ — Gryphon Investors (“Gryphon”), a San Francisco-based private equity firm, announced today that it has acquired a majority stake in LEARN Behavioral (“LEARN” or “the Company”), from LLR Partners. LEARN is the leading network of providers serving children with autism and other special needs. LLR and senior management will maintain minority stakes alongside Gryphon. The transaction marks Gryphon’s first investment in the behavioral health sector. Financial terms were not disclosed.